It’s so easy to let “everything else” take priority over our writing. 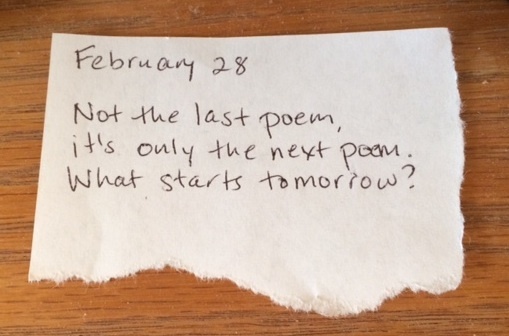 Your February 28th poem is inspiring, Karin, and I love that you’re entering into February this year, not with trepidation, but with enthusiasm. You go girl! Thanks for the inspiration to do the same. Thanks, Michelle! It really is remarkable how different my expectations are this year. I’m realizing that writing a blog post a day last May had an impact, too. Sounds like a great project! I’m glad it went so well last year. Having a “What starts tomorrow?” attitude is terrific.